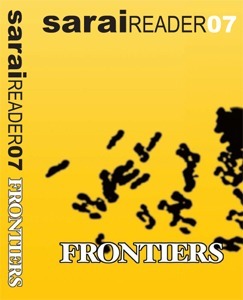 For us, the frontier is a threshold waiting to be crossed, a space rife with the seductive aura of transgression. We are not talking only of actual, physical borders (though of course we are interested in literal and political borders) that are usually the residues of war, but also of the borders between different temporal registers, between languages, between different modes of action, between different bodies of thought and conviction, between the exception and the rule. Looked at this way, a border is more than a constellation of fixed markers circumscribing a domain. We have always viewed the Sarai Reader as hospitable to new and unprecedented ideas, as a space of refuge where wayward reflections can meet half-forgotten agendas. We hope our text this year sets the stage for a productive encounter with the demand for an account of the boundaries, parameters and verges of our times.